The Bolton Hall Project is a sustainable, interactive and symbiotic relationship between Mount Gleason Middle School, Verdugo Hills High School, various commercial and individual community members and The Bolton Hall Museum / Little Landers Historical Society (LLHS). The major fund raising event for Bolton Hall, conducted by Little Landers Historical Society, is a community wide, very popular, plant sale – held each year in April. Some background: In 1962, Bolton Hall was named Los Angeles City Historical Monument Number Two (the Leonis Adobe in Calabasas is site number one). The Little Landers Historical Society vigorously worked to save Bolton Hall from demolition in 1959 and has been successful maintaining its restoration and oversight since. During restorative work, the interior of the building was kept as near to the original rock construction as possible; many safety changes were made as required. Bolton Hall is the archival home for artifacts of local history and research materials and currently presents popular exhibitions and events throughout the year. Informed docents lead visitors through the large meeting hall continuing the fun activities of community enrichment that the Little Landers of 1913 envisioned. The purpose of this project is to produce active community members living healthy lifestyles by developing involved, well-informed, and inclusive community programs targeting vertical integration (multiple generations) and horizontal integration (working professionals, retired professionals, at home workers, varying community cultures, and gender identity demographics). 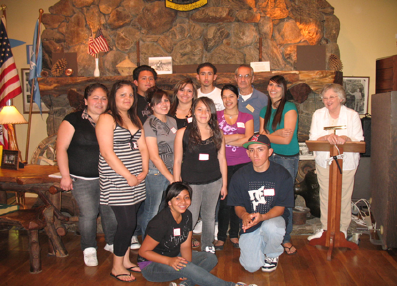 The Bolton Hall Program is a sustainable, interactive and symbiotic relationship among The Bolton Hall Museum, Verdugo Hills High School, Mount Gleason Middle School, and various commercial and individual community members and leaders. The facilities consist of two offices, a large combination meeting room and museum with historic rock fireplace, a research library, rest rooms, and residential quarters for an onsite caretaker. Informed docents lead visitors throughout the architecturally significant meeting hall and provide access to research materials. Little Landers Society presents popular exhibitions and events throughout the year as well as conducting fundraising campaigns on behalf of Bolton Hall. An annual plant sale is their largest source of income. 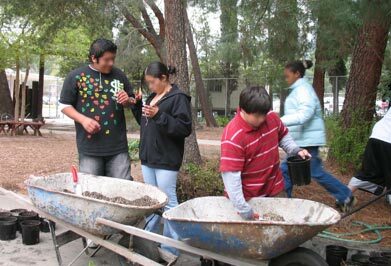 Verdugo Hills High School participates in the Service-Learning Program mandated for graduation within the Los Angeles Unified School District. Farming’s Future’s Bolton Hall Program is an approved Service-Learning Program. The mission is to provide to the Little Landers’ fundraising Committee a variety of plants appropriate for a successful annual plant sale. The Bolton Hall Program is designed to augment the fund-raising efforts for the Bolton Hall Museum.The funds are used to pay for electricity and the general maintenance and upkeep of the building. Because these students work closely with both stakeholders, meaningful relationships are developed enhancing the community holistically. The program includes weekly lessons where students will research and examine soil composition, a variety of propagation techniques and basic horticulture and plant identification to discover for themselves what might be appropriate in this micro community. The students additionally conduct research and analyze basic economic questions, marketing issues, and develop business plans and strategies, working among and with diverse groups. Additional skills such as leadership are developed by collaborating with the Mount Gleason Middle School students who propagate the seedlings. This program is supported by professionals and volunteers who have expertise to mentor and engage these students. Onsite faculty and administrative personnel monitor curriculum and logistics. The Economics and Science teachers take the lead position on campus. Local professors, teachers and interns augment weekly discussions and lessons. State and county agencies are consulted and provide expertise and materials. Farming’s Future’s board member Lisa Blomley, conducts a special class focusing on Pediatric Obesity and Diabetes; nutrition is emphasized. Local businesses provide gardening materials and extend outreach/marketing opportunities. The community stakeholders include local seniors’ groups (specifically those involved with the museum and Little Landers); parents, siblings and significant others supporting each student; residents interested in farm to table programs and healthy lifestyle proponents and community commercial vendors among others. In completing the program, the students organize and communicate their experience (and fundraising success) directly to the Administrative staff and faculty mentors. The plant sale is directed by Little Landers’ staff and the culmination event is held at the Bolton Hall site that includes refreshments, presentations from the students and the local newspaper and photographer. Mount Gleason students have participated in the Bolton Hall Program under the umbrella of one of Farming’s Future’s after-school programs. This school is less than one mile to the north of Verdugo Hills High School. Mount Gleason Middle School was originally built with an acre of agricultural property; the gardens are located to the southwest of the Administrative offices. Assisting with the propagation of seedlings and grafting under the direction of and side by side with the high-school students, these young students bridge relationships and discover new friendships at the high school – an important bridge as they matriculate. Farmings Future plans and presents workshops in a variety of venues, such as private schools, public schools, community centers, and scouting organizations. Please contact us to discuss your educational goals and your needs. 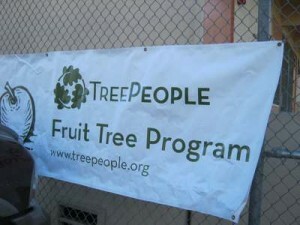 In partnership with the Tree People, Farmings Future distributes trees into the community during January and early February. Our workshop programs have become popular so please let us know as early as you can if you would like a workshop or lesson conducted at your school site, home, garden club, Tu B’Shevat event or actually any where during this season. The trees are typically bare root; however, beginning 2009, the Tree People and Farmings Future began distributing quartets, four mature trees planted into a two by two foot container. We would like to see the quartet program grow (pun intended) throughout the entire southern California population and the container boxes are especially pratical for families with little or no land, apartment dwellers or small patios. Many of you have asked to volunteer with this program. We really need help on delivery dates so if you have a truck or a big trunk in your car, that would be helpful. We also need volunteers to prune (we’ll show you how, just bring your shears and gloves) and some strong arms to lug sacks of soils and from time to time mix soil amendments. Please contact us whenever you have some time….We’ll put you to work immediately.